Examples, videos, worksheets, and solutions to help Grade 6 students learn how to find the greatest common factor using the upside down birthday cake method also called the ladder method. 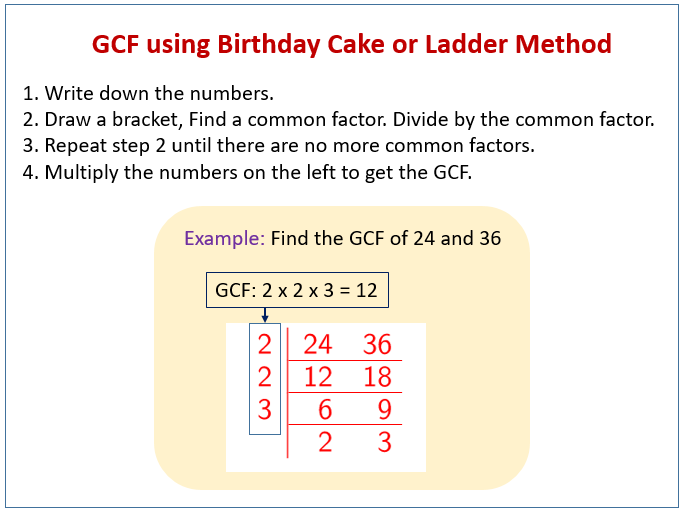 The following diagram shows an example of finding the greatest common factor using birthday cake or ladder method. Scroll down the page for more examples and solutions on the greatest common factor (GCF). How to find the Greatest Common Factor using the Birthday Cake Method? 1. Write down the numbers. 2. Draw a bracket, Find a common factor. Divide by the common factor. 3. Repeat step 2 until there are no more common factors. 4. Multiply the numbers on the left to get the GCF. Find the GCF of 30 and 75. This is an alternate way to determine the greatest common factor (GCF) for a set of numbers using the upside down birthday cake method. 1. Find the GCF of 12 and 42. 2. Find the GCF of 32 and 96. 3. Find the GCF of 196 and 260. 1. Find the GCF and LCM of 24 and 40. 2. Find the GCF and LCM of 12, 18 and 42. Find the GCF and LCM of 24 and 36.